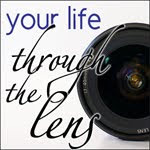 Do you like a little challenge in your 365 project? 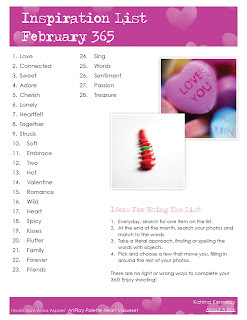 I've put together a downloadable PDF February 365 Inspiration List for you! 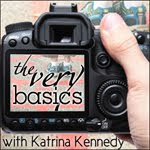 28 fun ideas to inspire your photography. This list is open to a lot of creative interpretation. You can use the list in several ways! Everyday, search for one item on the list. At the end of the month, search your photos and match to the words. Take a literal approach, finding or spelling the words with objects. Pick and choose a few that move you, filling in around the rest of your photos. There are no right or wrong ways to complete your 365. Enjoy shooting! I'll be using a combination of idea #2 and #3. What is your plan? I can't find the jan list did you have one? thanks so much for this! You're the bomb!